Werrington Jogger Anthony Johnson was the pick of the local crop of runners taking part in this year’s Leeds Abbey Dash. The road race probably has more strength in depth throughout the field than any other 10k race staged in Europe, and Johnson was delighted to secure a top 100 finish in a time of 32:06, which represented a massive personal best (PB) for the rapidly improving 27 year old. Nene Valley Harriers sent a healthy contingent of runners to a rain-soaked West Yorkshire. Lloyd Kempson was well below his best with a 35:00 clocking but Jevan Robertson earned himself a new personal best time, completing the crowded course in a time of 35.59. Ben Harding finished in 43:00 while Ruth Jones, who was hampered by breathing problems, finished 21 seconds further back. Peterborough AC’S Danny Snipe knocked three seconds of his previous PB with a time of 35.36. James Mogridge of Yaxley Runners finished fifth in the Riverside Half-Marathon on Sunday with his team-mate Mike Morley 42nd. On a day when many runners’ times were considerably down due to gale force winds, March AC member Geraldine Larham finished first female veteran Over 45, covering the undulating course in 91:54. 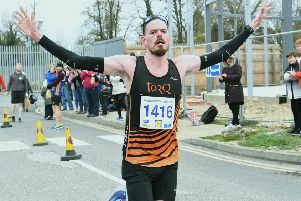 British Masters marathon and half-marathon gold medallist Phil Martin from Bushfield Joggers finished second in the Rockingham 10k at Corby on Sunday in a time of 35.07.